On May 8, Canadian Hillels in partnership with the Centre for Israel and Jewish Affairs (CIJA) released Going Somewhere? 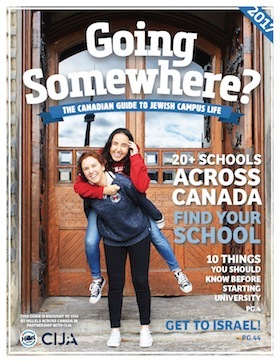 The Canadian Guide to Jewish Campus Life. Inspired by Maclean’s annual university guide, Going Somewhere? Provides students with information about Jewish life on campuses across Canada, as well as tips on how Jewish students can make the most of their first-year experience. Going Somewhere? includes campus-by-campus details on everything from Jewish student population numbers, access to kosher food, Jewish studies programs, academic exchanges with Israeli schools and popular housing locations for Jewish students, as well as Jewish social opportunities, such as holiday parties hosted by Hillel. Going Somewhere? also provides information about Jewish and pro-Israel campus advocacy opportunities, and paid internships offered by Hillel. To download a free copy of Going Somewhere?, visit gettheguide.ca.